All designed objects, whether conceived by an architect, artist or designer, tell a story. Their stories can sometimes be discerned easily, or need to be discovered through thoughtful consideration. The story can be as simple as a metaphor or as complex as a novel. The exploration of narrative in architectural design creates a level of meaning and connection to people that can be engaging and provoking. The ability for the observer to learn something beyond the obvious causes them to remain rather than pass by. Narrative architecture evolves from an introspective exploration of the client’s mission and passion; the building program or function; its site context; and often its place in history. Editing the message into a simple theme and then expanding it into a complete story creates the fullness of the experience. Materiality, structure, form and detail become the vehicles to impart the message(s). During the first project, students will be grouped into teams of 4, each team is challenged to translate a story from Sybil Kathigasu’s ‘No Dram of Mercy’ into a descriptive installation. Students are encouraged to ‘craft’ the artwork with all kinds of material/elements that could help describe the story. This studio will explore the relationship between architecture and site through the design of Memorial to commemorate the story of Kathigasu family and the forgotten history during world war two happened in Papan, a small town in Perak. The studio will be expressly concerned with the issue of design methodology, and a particular focus of the studio will be how to develop a project, as much as what is designed. Students will learn how to analyze design research and establish priorities among the many factors that influence a particular design, and how to develop concepts relating to those priorities. Studio members will learn how to translate their abstract concepts into architectural terms, using space, structure and materiality to articulate and communicate these concepts, and learn how detailing and tectonics can be used to reinforce the overall building concepts. Important to this discussion is the communication of ideas, and the studio will concern itself with how ideas and building concepts are clearly communicated, both verbally, graphically and three dimensionally. Students will learn how to develop and coordinate the many tools—drawings, text, graphics, models, verbal presentation—at their disposal in developing a consistent message about their project design. Such diorama was reconstructed into another form of narrative – the Papan Transcripts. The actors deconstructed the common site analysis strategy into a play, completed with its own scripts that mimic the adventures of a ninja to the various locations within Papan, as the individual selected site for the actors’ own proposal. These groups are assigned with a certain task to be completed within the group members and are subject to inter-group competitions, business arrangement and joint-studios. The assignments are classified under the following categories of Major Project (Mj), Minor Project (Mi), News Letter (N) to be carried out both individually (I) or collectively (g) and be graded evenly. Therefore, failure to execute on one category may effect the grade of other category. Moderation shall be conducted at the end of the semester by means of Portfolio Evaluation. Student shall be divided into the respective groups and to submit the followings, A3 Board About Myself, A3 Board About the Group. Based on site analysis, student to submit the followings, Site Massing Model as an entire studio, Revision 1,2,3,4…. Student to submit the followings, Micro-Planning – Determine the Brief Individually & as a group, Idea generation, based on previous student work to produce and submit, The Column, The Mask, The Costume, The Script, The Play/Recital. Based on the above said exercises, student to submit the followings, Detail Model Individually (1:100), Arch. Drawings Individually (9A1 Boards Min) Based on the above said design, student to submit the followings, Part Detail Model Individually (1:10), Arch. Drawings Consisting of At least 1 Sectional 3D Drawings Individually (9A1 Boards Min). Student to exhibit and presents the followings, All as the above in a presentable manner complete with A3 Brochure Folded with both sides printed to be handed over to the critic as and mat be required. Student to submit the followings, Newsletter to be published by the respective group at a weekly basis – every Thursday & Wednesday (Studio Sem-2), To sell the newsletter to other people. Provide 1 set each to studio master – in full color prior to the date of sale. I am happy to be given the opportunity to be part of the academic circle. I am happy to have met a towering figure, Prof Tajuddin. I am happy to meet the actors in person. My observation is that there is a drop in quality across the board and the weakness stem from the inability of the actor to understand the issue sufficiently to enable one to formulate a scheme via the vehicle of architecture as a socio-cultural intervention. There is a sheer lack of maturity in thought and fear in presenting discourse confidently. It seems to me that these generations are locked up in a box of misguided democracy. 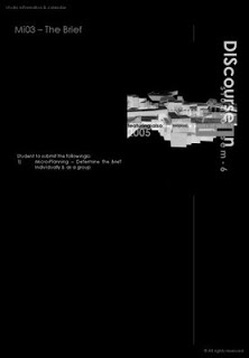 Their inclination to work with Computer Aided Drafting has resulted in a myopic approach diminishing the very important aspect of Architecture of understanding of 3D spaces, experiential with materiality, communicating ideas via sketches and endless discourse. For such, they are the “zombies” our University has created. A revivalism of the production model is urgently called for.